I’ve been putting off my review of the Amorepacific Time Response Skin Renewal Serum (and the rest of the Time Response line) for quite a long time. Not because I don’t know how I feel about the product, but because it’s a $500 serum. That price apparently exceeds my comfort level for talking about a skincare product by quite a lot. But ultimately, the point of accepting press samples is the opportunity to review products I wouldn’t otherwise be able or willing to acquire, and this is a hell of an opportunity. So let’s all go stick our wallets in the freezer and get down to business. This product was provided for my consideration by a Fifty Shades of Snail sponsor. Affiliate links, which enable me to receive a commission on purchases made by clicking them, are marked with an asterisk(*). 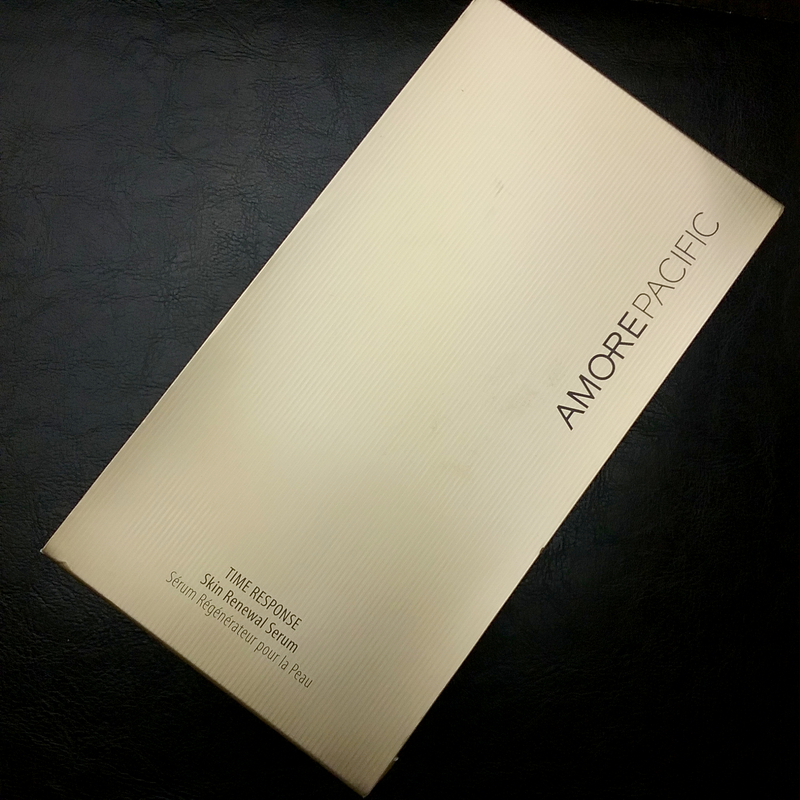 Earlier this year, I requested a few Time Response products from my friends at Amorepacific US*. It was a half-joking, “this is my dream list LOL” request, but to my shock, they came through. And so I began steeping my face in the highest of high-end products I’ve ever tried. Steeping. Get it? Green tea joke! Best suited for: All skin types except for sensitive skin. Do not use if: You are sensitive to alcohol, olive oil, coconut oil, fragrance, or anything else in the ingredients list. Notable ingredients: Okay, wow. That’s a monster of an ingredients list. It was about as much fun to type out and double-check as you might imagine. It may look impressive, but the important thing to note is that without published ingredient concentrations, there’s really no way for anyone without inside information to know whether any of the ingredients in the product are present in meaningful amounts. Or whether the ingredients listed are high enough quality and potency to have any effect on skin. Or whether the ingredients (especially the less researched botanical extracts) can even be absorbed and utilized by skin when applied topically. Those are serious questions about any product. 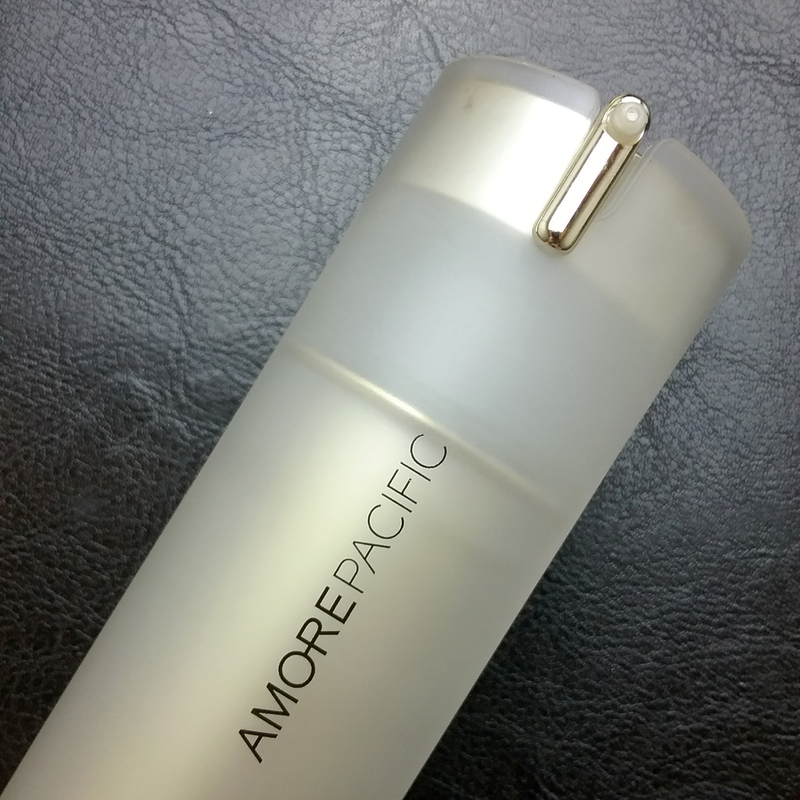 Their near-unanswerable nature may be the reason Amorepacific’s claims for this product are so vague. With that being said, WHOA. 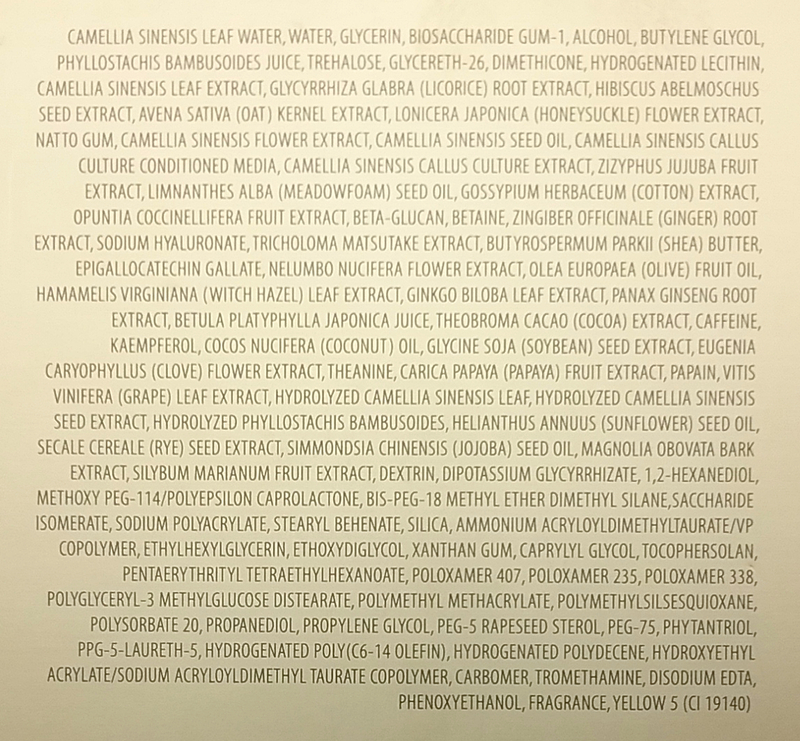 The Time Response Skin Renewal Serum contains a boatload of really interesting and intriguing ingredients, most notably all the different green tea ingredients. Amorepacific products focus heavily on green tea; the brand grows its own and claims to harvest and extract them under standards best described as comically rigid. Green tea callus culture “conditioned media”: I asked the brand for clarification on this ingredient but didn’t hear back. It sounds to me like the medium used to culture the calluses. EGCG, a remarkably potent antioxidant derived from green tea. Amorepacific’s brand rep told me that AP has developed a proprietary method of making this antioxidant effective through topical application. What all that green tea adds up to is the potential for a truly impressive antioxidant serum, even without all the other botanical extracts included in the formulation. Also promising are the licorice root extract, which may provide brightening benefits, and the bamboo ingredients, which may improve skin’s moisture retention. Finally, I see a couple of papaya ingredients in the mix. Papayas contain an enzyme which can provide a mild exfoliating effect. As I probably say too often at the end of these sections, however, there’s no way to tell whether any of that will bear out in practice. Only the performance of the product matters in the end. First, an apology! I normally include a photo of the actual product consistency in this part of a review, but my bottle ran dry unexpectedly. It’s a slight design flaw, actually. The sleek pale gold bottle has its advantages–it dispenses product precisely and hygienically from a thin pump nozzle, and it appears to be an airless pump mechanism so will maintain product potency for longer–but there’s no way to tell how much product is left besides feeling the weight of it. There also seems to be no way to open the bottle to look for just one last use without resorting to power tools. So I don’t have a texture photo. 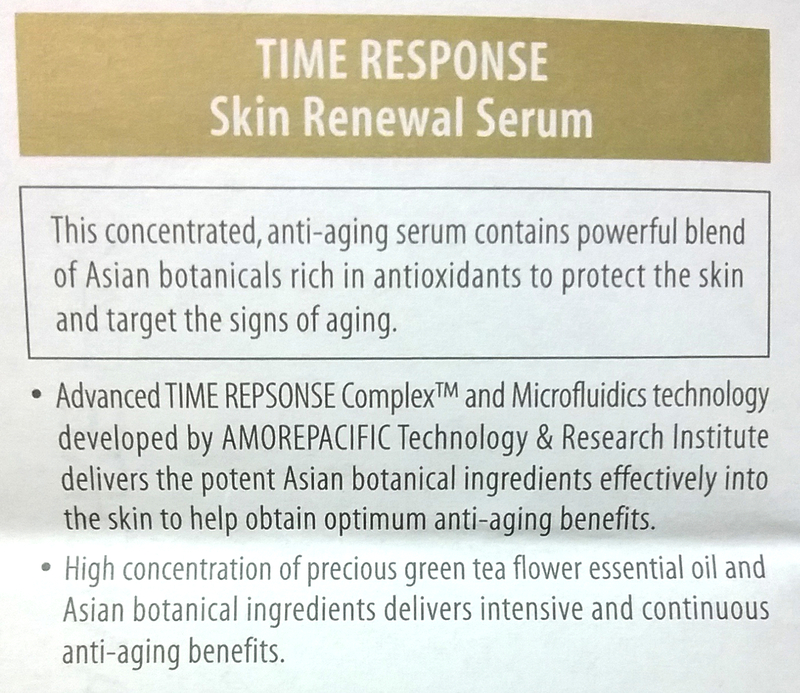 In any case, the consistency of the Time Response Skin Renewal Serum isn’t especially interesting. It’s a smooth gel-type serum of medium density. It spreads easily over skin and sinks in quickly, without any oily or sticky residue. Actually, the Time Response serum is a lot lighter than I expected it to be. I often associate “anti-aging” with “heavy and rich,” so I’m always pleasantly surprised by a lightweight finish. It’s moderately hydrating, though I personally wouldn’t rely on it for that purpose. The serum is very fragranced, which could be a problem for some people. It has the typical powdery-floral Amorepacific scent to it, and that scent is strong and lasts quite a while after application. Unlike many product fragrances, which I generally get used to and stop noticing after a while, the scent of the Time Response Skin Renewal Serum caught my attention every single time I used it. I wouldn’t say it caused any problems for me. I will say, however, that it came close to causing me some problems on days when I already had a headache or aversion to perfume. Here’s the thing about the botanical/antioxidant class of “anti-aging” serums: You have to go into the experience understanding that you can’t realistically expect the same kind of Results™ that you could get from standard (and more reasonably priced) actives, like tretinoin, vitamin C, or even an AHA. If a commonly used botanical extract could deliver the same level of reliable collagen building, pigmentation reducing, or surface smoothing as serious actives, I think we’d know about it by now. So using an actives-free anti-aging serum requires a serious leap of faith. You have to believe it’s providing antioxidants that really are helping to protect your skin from further damage and therefore delaying the visible signs of skin aging. Unfortunately, prevention is a damn hard thing to prove without years of testing. Hence, vague claims. Also, nice typo, guys. That’s not to say you can’t expect anything at all from this class of serums, though! I’ve tried a ton and have found several that do noticeably do some kind of a thing. 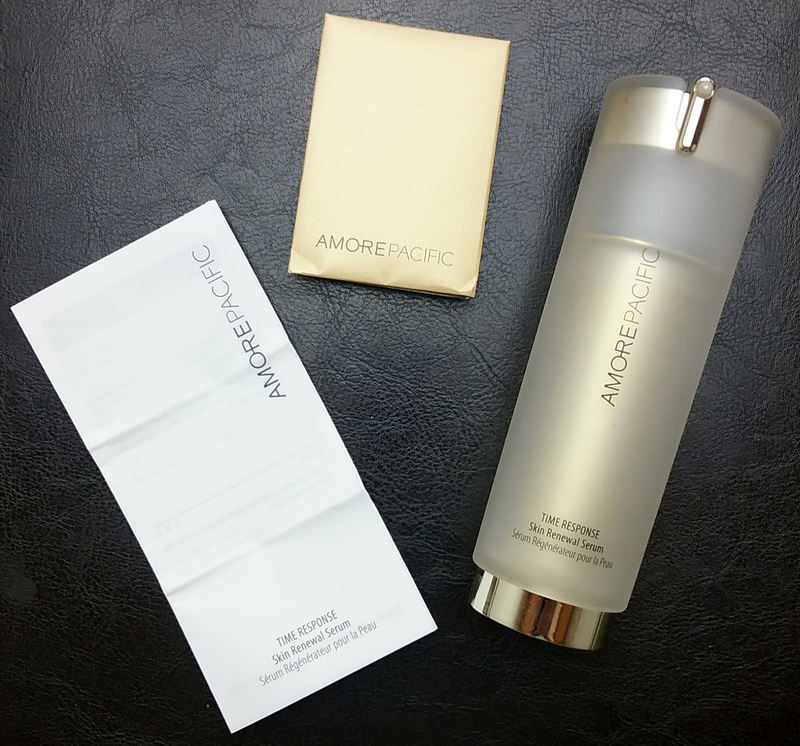 Happily for me, Amorepacific Time Response Skin Renewal Serum is one of those that does do a thing. I used the Time Response Skin Renewal Serum for about two months, with one break of a couple of weeks to gauge the difference in my skin without the product after using it. I also discontinued use of the rest of my anti-aging actives during that time. I dropped my Curology, I dropped my vitamin C serum, and during my most rigorous early testing weeks with the product, I wasn’t using AHA, either. After a couple weeks with the Time Response serum, I noticed an unmistakable resurfacing effect. My skin started to look and feel extra smooth and took on a distinctive luster. To me, the effect is equivalent to the results I might get from a weaker AHA, except without the inconvenient pH dependency and photosensitization side effect. I wouldn’t say the effect is enough to replace a standard chemical exfoliant if you’re using it to surface grits, prevent clogs, or significantly reduce PIH, but for skin texture alone, it works gently and well. My skin lost that extra smoothness and luster during the time between running out of product and reintroducing a regular AHA to my routine. Textural issues are generally considered a major sign of aging, so the smoothing effect I got from the Time Response Skin Renewal Serum does support its broad, vague “anti-aging” claims and the name of the product. Texture isn’t the only thing that deteriorates with time, though. Dark spots and other pigmentation issues can be a problem as well. Here, while I didn’t see any significant improvement in my little patches of sunspots, I also didn’t see any new ones or any increase in pigmentation issues. That may be a positive sign in itself. Certain antioxidants can prevent the melanin in skin from oxidizing and getting darker, so the maintenance of my current state could indicate those antioxidants working as they should. Firmness is also a key sign of visible skin aging. I currently don’t have firmness problems (that I know of) thanks to my previous steady regimen of tretinoin and vitamin C, so I didn’t really have a chance to see improvement. As with my pigmentation issues, however, I didn’t see any decrease even after stopping collagen-building actives, so that may say something. This should be taken off the market, or this failed at its one primary job. Caused me some problems; would not buy again. Meh. Neither great nor bad. Pretty good, does the thing. Conclusion: My time with the Time Response Skin Renewal Serum gave me smoother and fresher skin overall and may have helped maintain my current skin condition in the absence of stronger actives. The question is whether those effects alone are worth the extraordinary price tag of the product. If we’re talking visible effects only, then I’d say the answer is no, unless you specifically don’t want to use strong actives and you specifically do have the budget for a $500 serum (in which case, congratulations and have fun with that, because the world of luxury skincare is your pearl-containing oyster topped with truffles). If we factor in the “leap of faith” aspect and include the potential preventative effects of all those green tea ingredients and other botanical extracts, then the possible value of the product can increase pretty dramatically. Amorepacific is a sister brand to Sulwhasoo, and Sulwhasoo is one of the few brands whose extracts-focused products truly wow me. Due to my great experiences with Sulwhasoo products, I’m inclined to believe that their extracts really are a higher quality and potency than most. Since Amorepacific is a sister brand to Sulwhasoo and sells at comparable price points with comparable formulations, I’m willing to extend a little faith and say that AP extracts stand a good chance of being better than good, too. So if you have the budget, and you’re into extracts, and you’re willing to place some faith in unmeasurable preventative effects, and you want some skin-resurfacing effects without using strong actives (or want extra skin-resurfacing effects on top of your actives), then yes. 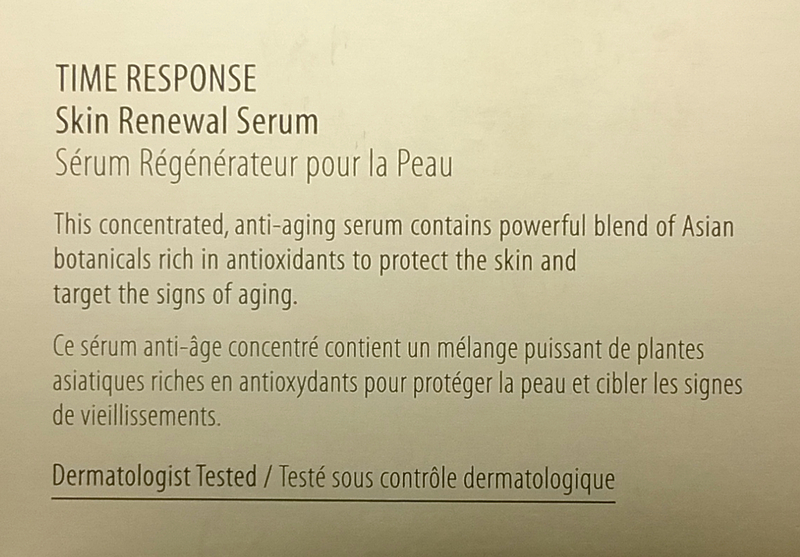 The Time Response Skin Renewal Serum could be worth a shot. Where can I buy Amorepacific Time Response Skin Renewal Serum? 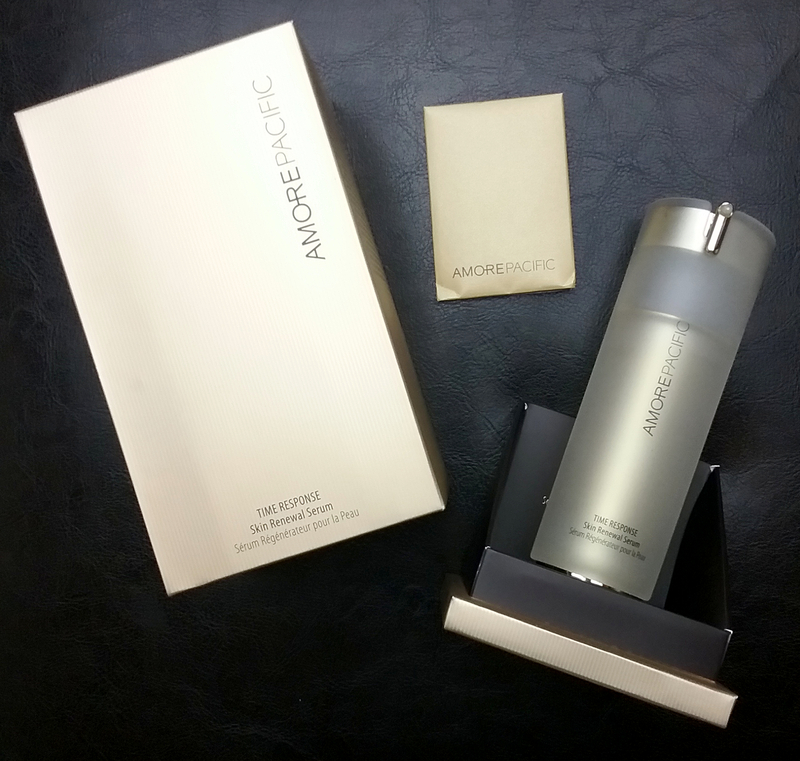 I received my 30ml bottle of Amorepacific Time Response Skin Renewal Serum from Amorepacific US*. If you’re considering buying, make sure to check my sidebar (scroll down if you’re on mobile) for my Amorepacific US coupon code and current extra gift. This post makes me sad. I love you Fiddy, and have read every post you have ever written, and I used to trust you for fair, unbiased reviews. But you basically say this serum is great for keeping your face exactly like it is, and is worth the price if you have $500 to throw into the wind. Then you factor “leap of faith” into the rating. Poking at a typo on the packaging doesn’t make this post seem any less biased. This is clearly written by someone who doesn’t want to bite the hand that gives them $500 serums. By all means, you should enjoy your gratis, but remember that your own policy states that you don’t guarantee a review. I agree with Kris, this review seemed… meh is the only word I can come up with. Fiddy used to be my go-to for reviews but with the sudden onslaught of press samples of fancy product I can’t ever even dream of affording; it makes me sad. Hey, I responded below to Kris but wanted to answer you right away too. I hear you and I definitely get what you’re saying; I’ve been thinking about the price points of the products I’ve been reviewing lately and struggling with realizing that the balance of the blog has gone off a bit. I have some reviews planned of more realistically priced products and I hope you’ll stick around for those. Thank you for making the effort to give me your feedback! Hey, I just wanted to say I hear you and am taking your criticism on board for some self reflection. I stand by my review and my moderately positive feelings about the product, and I hope I was clear about what can be expected of it and what can’t be, but I absolutely get where you’re coming from. I hope you’ll stick around and definitely hope future reviews can re-earn your trust. Thank you for taking the time to share how you feel. I really appreciate it! I haven’t been a big fan of the glut of press samples either, one reason beign that there have been so many I wonder how you can possibly do justice to specific product. I was also disappointed that the ‘sulwhassoo only’ routine seemed to lose steam after only a short period of time. And I was hoping to hear about all the Decleor that you received. That said, I really didn’t have the issues that others seemed to have with this review. While I don’t see myself spending 500usd on a serum I do like to hear what the experience of using such an expensive serum is. I really don’t want to just read about CosRx. Its like when I read Vogue, I don’t want to just see handbags that I can afford. I want to see the aspirational stuff too. Recherche and they have a series of four or five wands which gauge different aspects of the skin like moisture levels, elasticity, conditon of moisture barrier, etc. The results show up on a computer. Since the efficacy of anti-aging serums is quite subtle and difficult to quantify perhaps a skin analysis before and after several weeks of use would be a good way to demonstrate the effects of the serum beyond just ‘how it feels to you’. I know that I would have personally loved to see something like that in this review. Hi there and thank you for sharing your thoughts! I love the suggestion about a skin analysis system and now am wondering if I can get my hands on a really good one like the one you described. I’ve had a couple of consumer level ones and don’t find they give the kind of detailed feedback I really want, but lord, one that can gauge elasticity and stuff would be great. So appreciate the suggestion! The Decleor products, like the vast majority of PR I receive, never made it to the review stage because I didn’t find them compelling enough for a variety of reasons. Just not suited for my skin or tastes (one reason being the heavy aromatherapy component). There’s a barrier to getting into my routine that most things don’t pass, if that makes sense! I read all the comments here, and it’s an interesting conundrum. After all, we of the Non-Blogging Clan are relying on unpaid bloggers to do all this testing, trials, suffering and glory of discovery on our behalf. We all sort of turn a blind eye to the ads, etc., realizing that of course, a blogger DESERVES to earn some shekels, for the value of everything that we’ve learned from her. But on the other hand, then we see comments that say that the blogger shouldn’t accept sample products, because the resulting trial/article will reflect a bias. Do we really all think that a blogger–amongst millions of others–will earn enough from a few ads, to pay for the hundreds or thousands of products that they test? I certainly don’t. Nor do I think it’s fair that we insist that the Blogger pay for all this crap out of her own pocket. Who could afford that? Especially talking about products like this Sulwhasoo, at $500/pop. Sure, maybe the blogger could find a free or cheap sample…but that might cause the blog to be awfully sporadic, if the blogger is, to paraphrase the immortal words of Tennessee Williams, “dependent on the kindness of strangers.” Sure, you can argue that she is, anyway, in taking products from the companies…but we cannot sit here and expect our bloggers to be independently wealthy enough, and motivated enough, to do a half-decent blog for our entertainment and educational value. So, Fiddy…I still love ya. Yes, I thought that perhaps, you softened the “edge” on this post–how else could you expect to ever receive Sulwhasoo products again, from them?–but I understand why you took the product, and I for one am glad you did. I’m just daft enough to buy something like that, or get a small sample, and waste time waiting for it to do something–and you’ve saved me the trouble. I understand the economic realities of running a small business–which is what a blog is–and I understand the tightrope that you walk. Thanks for doing such a good job at it. Hey, I know I have been horrid at answering comments lately, but I really wanted to thank you for your thoughtful comment here. I really appreciate it and have had a lot of food for thought. The last thing I want to do is let you guys down.